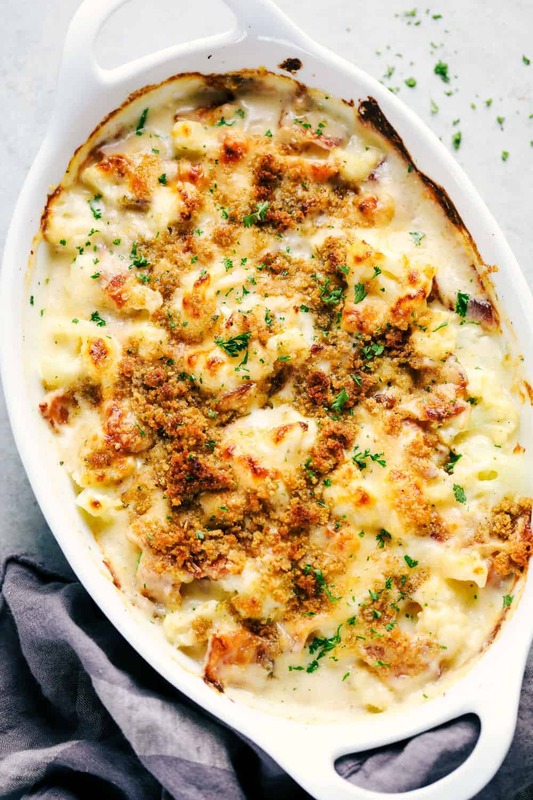 Creamy Cauliflower Au Gratin with Bacon makes such an amazing side dish. 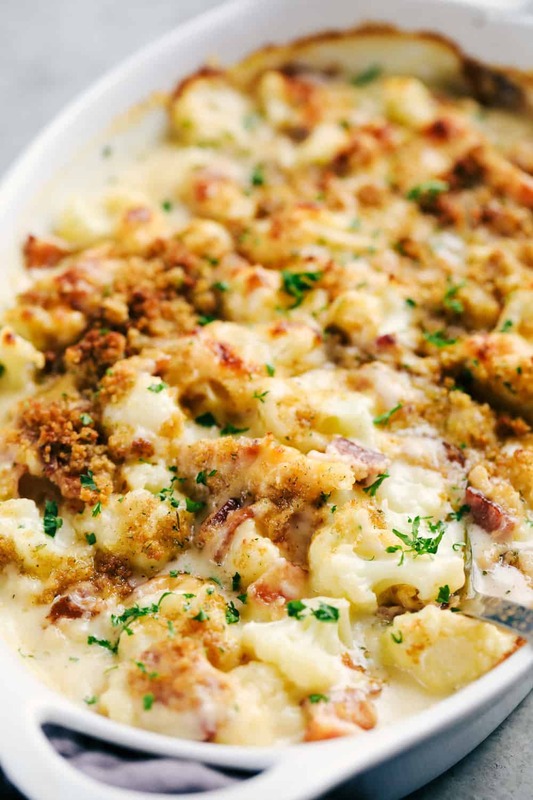 It is filled with tender cauliflower and bacon in a cheesy sauce that is topped with bread crumbs. This will be the hit of the dinner table! This is my favorite time of the year and I especially love gathering with my loved ones around the dinner table. A big holiday feast, neighborhood brunches, family dinner… it seems like there is no end to the holiday celebrations. Smithfield is here to allow you to soak in the best parts of the holiday season and bring you just what you need to make your hosting for all occasions effortless. From easy centerpiece and decor ideas to recipe inspiration, Smithfield has you covered. For this recipe I used their Cherrywood Stack Pack Bacon. I absolutely love the quality of the thick cut bacon and have been so excited to share this recipe with you today. This makes the absolute perfect side dish for this holiday season, and all year long! The bacon became the star in this delicious and creamy casserole. This casserole gets loaded with a cheesy sauce and the hidden bacon inside adds so much flavor to this dish. 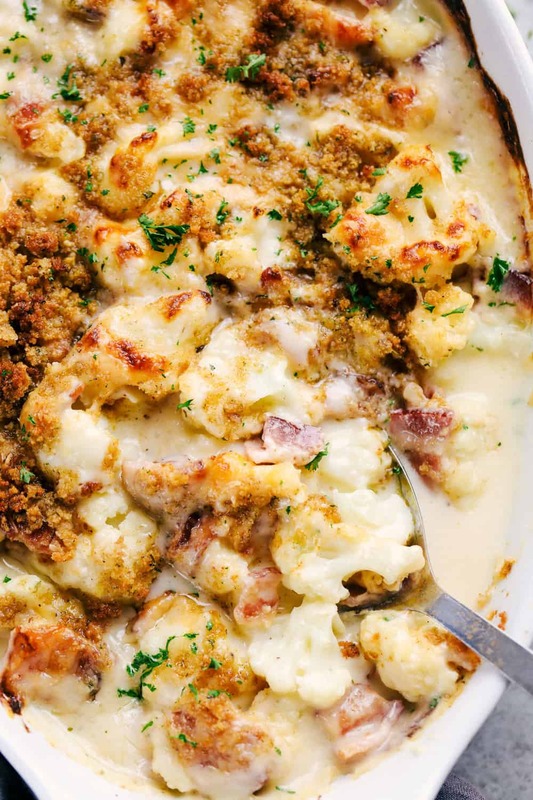 How do you make Creamy Cauliflower Au Gratin? To start, steam or boil your cauliflower for about 5 minutes but it should still be firm. Drain and place in a 2 quart casserole dish. In a medium sized skillet add the bacon pieces and cook until they are crisp. Sprinkle on top of the cauliflower. In a medium sized saucepan add the butter and melt. Add the flour and cook about a minute until it thickens. Slowly whisk in the milk and add in cheese, salt and pepper. Whisk until cheese is melted and sauce has thickened. 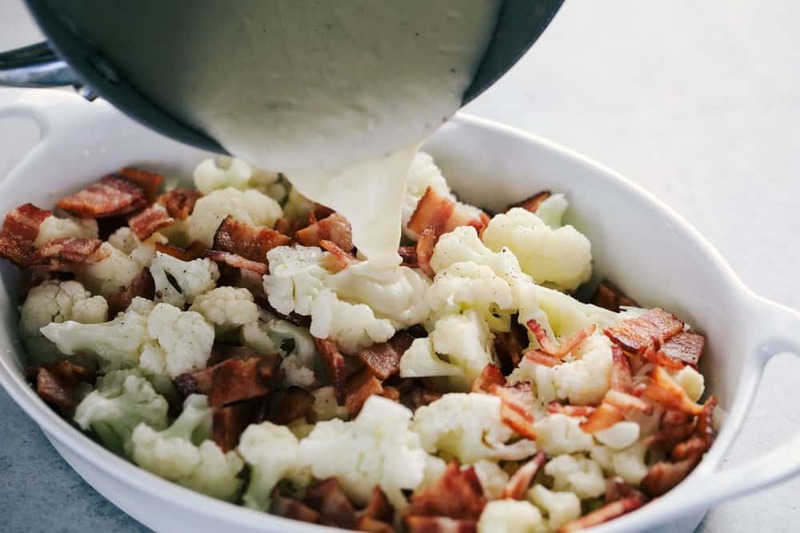 Pour the sauce evenly on top of the cauliflower and bacon. Top with parmesan cheese. Mix bread crumbs with melted butter and sprinkle over the top. Bake at 375 degrees for 20-25 minutes or until heated through and bubbly. Can I substitute another vegetable for cauliflower? Absolutely! The great thing about this dish is that you can also use a different vegetable. Broccoli or Brussels sprouts would be a great substitute for this side dish as well. This dish can be made ahead and frozen. After you freeze the dish, thaw it in the refrigerator and bake as directed. The dairy may have different textures, but it should still taste amazing. The holiday possibilities are endless with Smithfield. They also have breakfast sausage, and holiday hams. They have so many easy recipes like breakfast dishes to make with your kids during winter break, creative appetizers, and the perfect ham and side dishes for the big holiday feast. There is nothing you can’t do with Smithfield this season. You can visit Smithfield all season to make your holiday planning a breeze. They have so many foolproof tips and simple recipes that will wow all of your holiday guests. Your holidays just got easier with Smithfield and you will have flavor-filled dishes for all of the celebrations the season brings! With every pack of Smithfield Bacon you purchase, you can enter for the chance to win Bacon for Life! 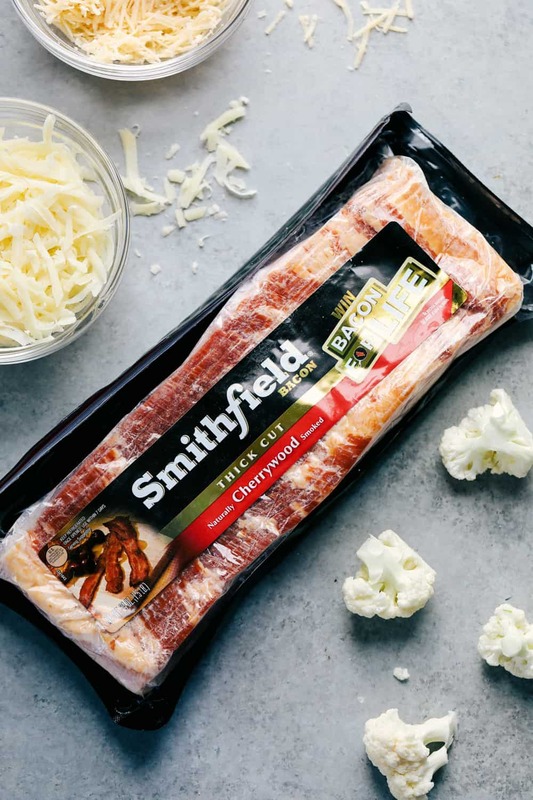 From now until December 31, bacon lovers everywhere can look specifically for marked packages of Smithfield Bacon in stores and visit Smithfield.com/baconforlife to enter to win! In a medium sized skillet add the bacon pieces. Cook until crisp and sprinkle on top of the cauliflower. In a medium sized saucepan add the butter and melt. Add the flour and cook about a minute until it thickens. Slowly whisk in the milk and add in cheese, salt and pepper. 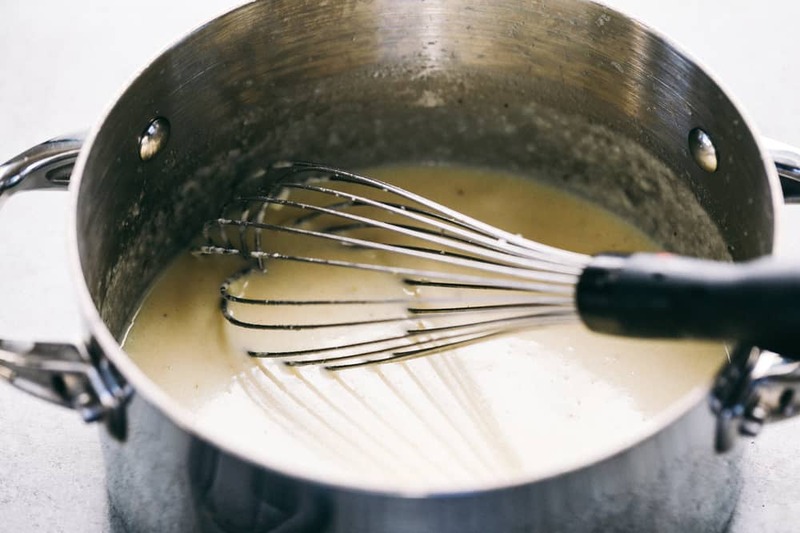 Whisk until cheese is melted and sauce has thickened. 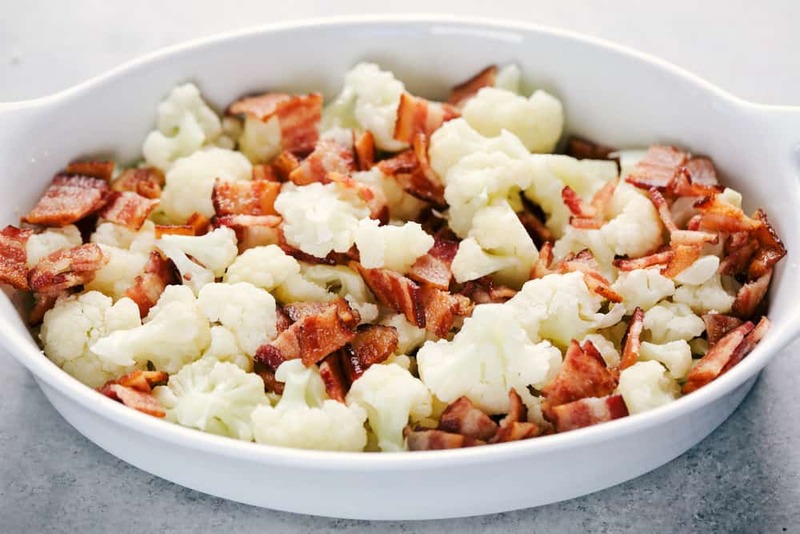 Pour evenly over the cauliflower and bacon. Top with parmesan cheese. Mix bread crumbs with melted butter and sprinkle over the top. Bake at 375 degrees for 20-25 minutes or until bubbly and slightly brown at the top. This post was sponsored by Smithfield. I love working with brands that I use for myself in the kitchen. All opinions expressed are my own.